Diamond Select Toys has announced that they will be releasing a new Enterprise based on the movie Star Trek 2: The Wrath of Khan. A Diamond Select Release! An Art Asylum Design and Sculpt! 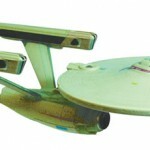 Measuring 16″ long, the Star Trek II: The Wrath of Khan version of the U.S.S. Enterprise features authentic lighting and sound effects from the classic film, along with an all-new paint scheme. Sculpted and designed by Art Asylum, this legendary vessel ships in window box packaging. The Next Generation Enterprise-D is scheduled for release in March (http://diamondselecttoys.com/store.a...tegoryID%3D335) But I got the Star Trek 2 Enterprise for Christmas. It's been out for a while. Maybe it's being RE-released in February. Or maybe it's a different edition? I heard something about a "Battle-Damaged" Star Trek 2 Enterprise, but I don't know if/when it was released. And I didn't see anything about battle damage in the post. The Next Generation Enterprise-D is scheduled for release in March (Diamond Select Toys & Collectibles) But I got the Star Trek 2 Enterprise for Christmas. It's been out for a while. Maybe it's being RE-released in February. Or maybe it's a different edition? I heard something about a "Battle-Damaged" Star Trek 2 Enterprise, but I don't know if/when it was released. And I didn't see anything about battle damage in the post. This is a different release with a new paint scheme.